Insulin-producing beta cells emerge during pancreas development in two sequential waves. Recently described later-forming beta cells in zebrafish show high similarity to second wave mammalian beta cells in developmental capacity. 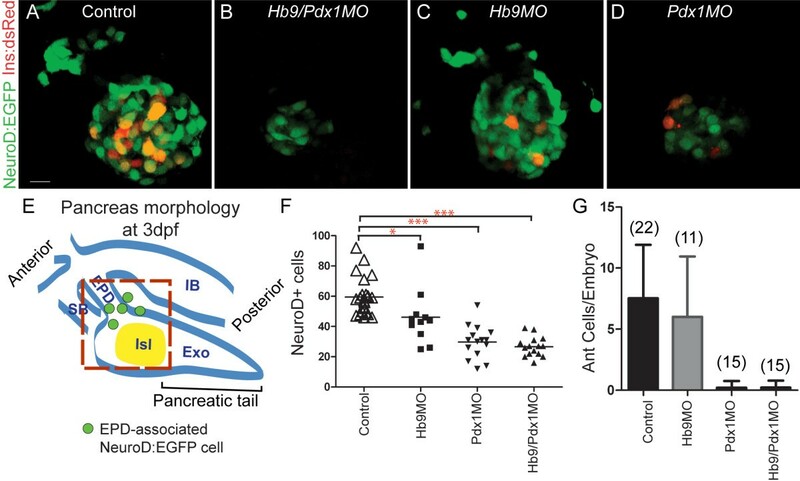 Loss-of-function studies in mouse and zebrafish demonstrated that the homeobox transcription factors Pdx1 and Hb9 are both critical for pancreas and beta cell development and discrete stage-specific requirements for these genes have been uncovered. Previously, exocrine and endocrine cell recovery was shown to follow loss of pdx1 in zebrafish, but the progenitor cells and molecular mechanisms responsible have not been clearly defined. In addition, interactions of pdx1 and hb9 in beta cell formation have not been addressed. To learn more about endocrine progenitor specification, we examined beta cell formation following morpholino-mediated depletion of pdx1 and hb9. We find that after early beta cell reduction, recovery occurs following loss of either pdx1 or hb9 function. Unexpectedly, simultaneous knockdown of both hb9 and pdx1 leads to virtually complete and persistent beta cell deficiency. We used a NeuroD:EGFP transgenic line to examine endocrine cell behavior in vivo and developed a novel live-imaging technique to document emergence and migration of late-forming endocrine precursors in real time. Our data show that Notch-responsive progenitors for late-arising endocrine cells are predominantly post mitotic and depend on pdx1. By contrast, early-arising endocrine cells are specified and differentiate independent of pdx1. The nearly complete beta cell deficiency after combined loss of hb9 and pdx1 suggests functional cooperation, which we clarify as distinct roles in early and late endocrine cell formation. A novel imaging approach permitted visualization of the emergence of late endocrine cells within developing embryos for the first time. We demonstrate a pdx1-dependent progenitor population essential for the formation of duct-associated, second wave endocrine cells. We further reveal an unexpectedly low mitotic activity in these progenitor cells, indicating that they are set aside early in development. 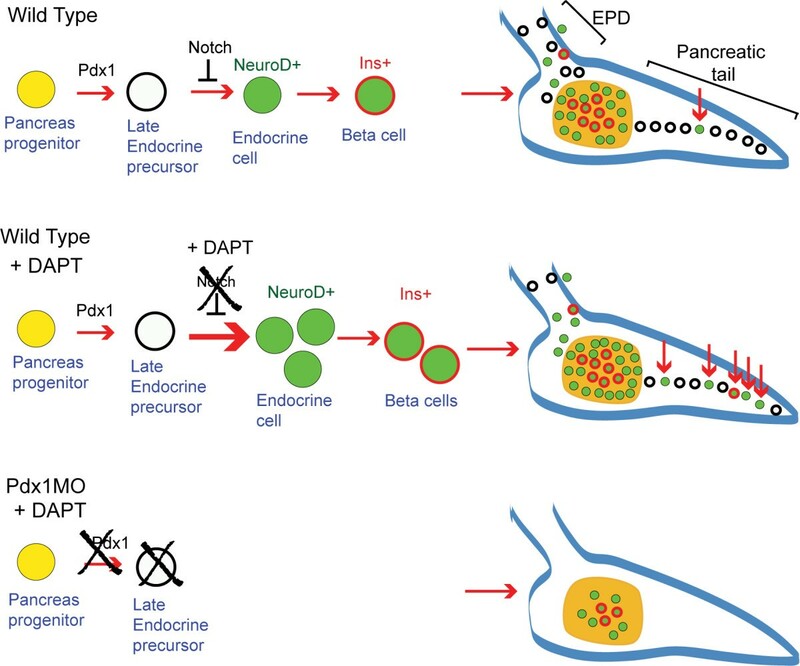 In the vertebrate pancreas, the increase in endocrine cells during late and post-embryonic development is caused by de novo progenitor differentiation and proliferation of pre-existing endocrine cells . In mice, the majority of endocrine cells arise after embryonic day 12.5 (e12.5), from cells located in the branched epithelium of the dorsal and ventral buds. These second wave endocrine cells delaminate, migrate and cluster into numerous islets [1, 2]. In addition, early-forming, first wave endocrine cells of unknown function appear before epithelial branching at e9.5, but do not contribute to mature islets . Only recently, two waves of endocrine cell development were also observed in zebrafish. Similarly, cells with a mature gene expression profile only form during the second wave, while the early cells do not contribute to the later bulk of mature beta cells that produce insulin at high levels . The zebrafish pancreas arises from two progenitor domains called the dorsal bud and ventral bud (DB and VB, respectively), which have distinct differentiation potentials [3, 4]. The DB forms before 24 h post fertilization (hpf), and consists of clustered early endocrine cells called the principal islet. The VB arises from the gut tube after 34 hpf, and these cells migrate to engulf the principal islet [4, 5]. Cells of the VB expand posteriorly to form the pancreatic tail and differentiate into exocrine cells, duct cells, and late arising (second wave) endocrine cells. The ventral bud-derived ductal system includes the attachment of the pancreas to the gut (extrapancreatic duct (EPD)), and a branching network in the expanding pancreatic tail (intrapancreatic duct (IPD)). Late endocrine cells in zebrafish appear to originate from progenitors located in or adjacent to the ductal system and contribute to expansion of the large principal islet and also coalesce to form scattered smaller secondary islets [5–8]. The emergence of late endocrine cells is considered analogous to the second wave of endocrine cell differentiation in mammals [3, 5, 7]. Pancreas formation requires the function of a highly conserved network of hierarchically expressed transcription factors. Among them, Pdx1 and Hb9 (also called Mnx1, Hlxb9) play key roles in pancreas and beta cell development, as demonstrated by loss-of-function studies in mice [9, 10]. Pdx1 is expressed throughout the early pancreatic progenitor domain and is highly expressed in mature beta cells. Pdx1 is not required for the formation of first wave endocrine cells in mice [11, 12], but promotes second wave islet cell formation [13, 14]. Hb9 is expressed in a pattern overlapping with Pdx1 in the early progenitors of the dorsal and ventral buds . After formation of pancreatic buds, Hb9 is initially downregulated, and is activated again in differentiating beta cells [16, 17]. Loss of function Hb9-/- mice lack the dorsal bud, while ventral bud-derived islets are smaller and have decreased numbers of incompletely differentiated beta cells [16, 17]. In zebrafish, morpholino knockdown approaches have been used to study pancreatic function of hb9 and pdx1 [18–20]. Following morpholino-mediated pdx1 knockdown, embryos showed delayed appearance of both exocrine and endocrine cells but displayed an almost normal overall structure of the pancreas by 5 days post fertilization (dpf) [18, 19]. This reported recovery raises questions about the requirement for pdx1 in progenitor specification in zebrafish. hb9 is expressed broadly in the endoderm during early somite stages and becomes restricted to insulin-producing beta cells after onset of endocrine differentiation at 15 hpf. Morpholino knockdown analysis revealed a requirement for hb9 in early beta cells . The coexpression of pdx1 and hb9 in beta cell progenitors suggests possible functional interactions that have as yet not been assessed. Differentiation of beta cells from progenitors is coordinated with morphogenetic events that include delamination of precursors from the ductal epithelium, migration and islet assembly. Real-time imaging of this dynamic process has not been previously achieved, as direct observation is prevented by the deep interior location of the pancreas. Such studies are feasible in transparent zebrafish embryos. However, as visual access to the developing gut is obstructed by the large yolk cell, observation of endocrine cell emergence requires the implementation of new imaging approaches. Regulation of cell fate decisions in pancreatic endocrine progenitors involves Notch-regulated lateral inhibition that in mouse leads to increased Ngn3 expression in a subset of cells within the nascent duct epithelium and induction of proendocrine transcription factors such as NeuroD [10, 21, 22]. Although the presumed zebrafish ngn3 ortholog appears not to be functionally equivalent to the mouse gene based on timing and localization of expression [6, 23], NeuroD is expressed in early precursors that give rise to all endocrine cells in both mouse and zebrafish [24–27]. In mouse, NeuroD was found to have the capacity to drive endocrine differentiation in pancreatic progenitors . NeuroD expression is maintained in insulin-positive beta cells, while it is downregulated in the other endocrine cell types . In this study, we aimed to achieve a better understanding of beta cell progenitor specification and behavior, and the dependence of these processes on pdx1 and hb9. After early reduction of beta cell numbers following morpholino-mediated depletion of hb9 or pdx1, there is recovery of insulin expression at late stages. In contrast, loss of both pdx1 and hb9 leads to an essentially complete and persistent absence of beta cells. A detailed analysis of endocrine precursors in wild-type and morpholino-treated embryos using a NeuroD:EGFP transgenic line revealed cooperative activity of hb9 and pdx1 in establishing beta cell fate. Importantly, we define a requirement for pdx1 in latent, duct-associated, Notch-responsive progenitors responsible for the production of second wave endocrine cells. These investigations were facilitated by the establishment of new protocols for in vivo timelapse imaging that allow visualization of delaminating and migrating endocrine precursors at high resolution. To determine how beta cell differentiation is affected by the depletion of hb9 and pdx1, we examined insulin (ins) expression over a time window of 5 days following morpholino (MO) injection. Consistent with previous studies [18, 20, 29], hb9 and pdx1 MO-treated embryos (morphants) analyzed by RNA in situ hybridization at 24 hpf had a marked decrease in ins expression (Figure 1C,E, compared to A). As seen in previous analyses of pdx1 morphants, we now show that also in hb9 morphants there was a substantial recovery of beta cell development and ins expression by 5 dpf (Figure 1D,F,I). ins mRNA expression in hb9 and pdx1 morphants. In situ detection of ins mRNA in wild-type embryos (A,B), hb9 morphants (C,D), pdx1 morphants (E,F) and hb9/pdx1 double morphants (G,H) at 24 h post fertilization (hpf) and 5 days post fertilization (dpf). In hb9 and pdx1 morphants the number of ins expressing cells is strongly reduced at 24 hpf as compared to control embryos (A,C,E) but has substantially increased by 5 dpf (D,F). (G,H) ins expression is missing in most double morphants (arrow in H marks a single ins positive cell). Embryos are shown from ventral (24 hpf) and lateral (5 dpf) view with anterior to the right. Scale bars correspond to 20 μm (24 hpf) and 50 μm (5 dpf). (I) Proportion of embryos showing > 5 Ins+ cells in control and morphant embryos at 3 dpf and 5 dpf. Beta cells emerge between 3 dpf and 5 dpf in hb9 and pdx1 morphants, while there is persistent absence in the hb9/pdx1 double morphant. We next asked the question whether hb9 and pdx1 might cooperate in beta cell formation by coinjecting embryos with hb9 and pdx1 morpholinos. This resulted in an almost complete lack of ins expression at 24 hpf (Figure 1G). This phenotype persisted, and at 5 dpf and 9 dpf, hb9/pdx1 morphants showed virtually no ins expression (at 5 dpf 92% < 5 ins cells, n = 64; Figure 1H,I and at 9 dpf 93% < 5 ins cells, n = 14). To exclude that pancreatic development is globally disrupted in the double morphant, we examined expression of the exocrine marker carboxypeptidase A (Cpa). As in the pdx1 morphants [18, 19], hb9/pdx1 double morphants show substantial development of exocrine tissue at 4 dpf [see Additional file 1]. We also asked whether pdx1 expression returns at later stages in morpholino-injected embryos, by examining Pdx1 protein in morphants. At 28 hpf and 48 hpf, Pdx1 expression is entirely absent in the developing gut and pancreas of pdx1 morphants (n = 13 [see Additional file 2A-F]). At 84 hpf during normal development, Pdx1 is strongly expressed in cells of the islet with lower expression in the exocrine pancreas (n = 8 [see Additional file 2G]), while pdx1 morphants have low levels of Pdx1 protein in exocrine pancreas and islet at this stage (n = 8 [see Additional file 2H]). Thus, the morphant is not completely devoid of Pdx1 at late stages, but a low level of expression is observed that allows rescue of exocrine development and may account for the recovery of beta cells. Two mechanisms could account for the persistent absence of beta cells in the hb9/pdx1 double morphants: endocrine precursors may not be specified, or they may fail to differentiate. To distinguish these possibilities we analyzed green fluorescent protein (GFP) expression in morphant embryos transgenic for TgBAC(NeuroD:EGFP)nl1 . These fish express enhanced green fluorescent protein (EGFP) integrated into the NeuroD locus contained in a bacterial artificial chromosome (BAC) by homologous recombination. EGFP expression has been reported to recapitulate NeuroD expression in the nervous system. We now confirm that EGFP in TgBAC(NeuroD:EGFP)nl1 embryos is first expressed in dispersed cells of the prepancreatic endoderm, which migrate posteriorly and cluster to form the principal islet by 24 hpf [see Additional files 3A and 4]. In a subset of cells there is coexpression of endocrine hormones [see Additional file 3B-G], recapitulating endogenous NeuroD expression in islet cell precursors [25, 27]. In addition, the stability of EGFP allowed us to trace endocrine precursors during maturation after the downregulation of the endogenous NeuroD. To assess endocrine precursor specification in hb9/pdx1 double morphants, we quantified pancreatic EGFP+ cells at 28 hpf, that is, before the emergence of the ventral bud. At 28 hpf, double morphant embryos displayed a slightly reduced number of EGFP positive cells as compared to controls (Figure 2A-C). In addition, while EGFP+ cells in control embryos formed a compact islet (n = 12), 50% of double morphants (n = 20) showed loosely clustered or even widely separated GFP+ cells (Figure 2B), suggesting disrupted migration. Thus, early endocrine cells were specified in these morphants, albeit at reduced levels, and the residual endocrine cells displayed defects in migration. Disrupted precursor specification and differentiation in hb9/pdx1 double morphants. (A,B) Projections of confocal image stacks of native enhanced green fluorescent protein (EGFP) expression in control uninjected and in hb9/pdx1 morpholino injected TgBAC(NeuroD:EGFP)nl1 embryos at 28 h post fertilization (hpf). In morphants, the clustering of EGFP labeled cells is disrupted (B) and the number of EGFP expressing cells is reduced as compared to controls (C). By 52 hpf, NeuroD:EGFP cell numbers have increased in control embryos, but not changed in the morphants ((C), *P < 0.05, ***P < 0.001 as determined by one-way analysis of variance (ANOVA) with Bonferroni's post test). (D) Schematic depicting overall gut morphology in 52 hpf embryos. EPD, extrapancreatic duct; IB, intestinal bulb; ISL, islet; SB, swim bladder. (E,F) Confocal image projections of control uninjected (E) and hb9/pdx1 morpholino injected (F) TgBAC(NeuroD:EGFP)nl1;Tg(ins:dsRed)m1018 embryos at 52 hpf that were costained with antibodies against pan-cadherin (light blue) to outline epithelial structures. In control embryos, EGFP+ and EGFP+/DsRed+ cells are mainly found in the islet. A rare EGFP+/DsRed+ cell is seen in a distal location (E, arrow). In double morphants, few to no EGFP/DsRed-expressing cells can be detected and many EGFP+ cells are located at ectopic positions outside the developing gut epithelium (F). Scale bar = 15 μM in all panels. All embryos are shown from ventral view, anterior to the left. We next examined endocrine cell specification and differentiation at 52 hpf, after the fusion of dorsal and ventral buds. For this analysis we used embryos that were double transgenic for TgBAC(NeuroD:EGFP)nl1 and Tg(ins:dsRed)m1018, enabling simultaneous visualization of progenitors and differentiated beta cells by EGFP and dsRed, respectively, and in addition immunostained the embryos for pancadherin to delineate gut morphology (Figure 2D-F). In control embryos, the average number of EGFP+ cells increased by 20% between 28 hpf and 52 hpf (from 49 to 59 cells), but these remained essentially constant in number in the double morphants (average 39 cells; Figure 2C). Control embryos had an average of 18 EGFP+/DsRed+ cells (n = 12), compared to double morphants that had few to no DsRed+ cells (0 to 5 EGFP+/DsRed+ cells in 14/14 embryos) (Figure 2E,F). Furthermore, 47% (7/15) of double morphant embryos showed clusters of EGFP+/DsRed- cells located at a distance from the islet and outside of the pancadherin stained gut epithelium (Figure 2F). Only one ectopic EGFP+ cell was seen in a single control embryo (n = 12), and this cell also displayed robust DsRed expression (Figure 2E). As DsRed takes 24 h to reach its half maximal fluorescence intensity , this likely represents a rare displaced early rather than a late beta cell. In summary, our analyses show that early endocrine cell specification occurred in hb9/pdx1 double morphants, and therefore a deficit in differentiation contributes to the absence of ins-expressing cells at later developmental stages. In addition, the formation of second wave endocrine cells was disrupted, as the number of NeuroD:EGFP cells did not increase after 28 hpf in double morphants. We next analyzed NeuroD:EGFP cells in the islet of morphant embryos at 3 dpf to determine if emergence of second wave endocrine cells was delayed. Strikingly, hb9/pdx1 double morphants displayed a persistently low number of NeuroD:EGFP+ cells in the principal islet, which even appears reduced relative to earlier time points when only cells in the vicinity of islet and extrapancreatic duct were counted (Figure 3E), and distal cells outside of the gut were not included (Figure 2F). Absence of ventral bud endocrine precursors in hb9/pdx1 and pdx1 morphant embryos. (A-D) Projections of confocal stacks showing native fluorescence of 3 days post fertilization (dpf) TgBAC(NeuroD:EGFP)nl1; Tg(ins:dsRed)m1018 embryos. In uninjected control embryos (A) and in hb9 morphants (C), enhanced green fluorescent protein (EGFP)+ cells are found in the islet and in smaller numbers also anterior to the islet. In hb9/pdx1 double morphants (B) and pdx1 morphants (D), the number of islet-associated EGFP+ cells is strongly reduced and anterior cells are missing. Few Ins:DsRed cells are present in pdx1 single morphants at 3 dpf (D), reflecting slow maturation of the DsRed fluorophore. (E) Schematic of pancreas morphology at 3 dpf. The principal islet (Isl) at this stage is primarily dorsal bud derived. The ventral bud contributes new NeuroD:EGFP cells (green circles), and generates exocrine pancreas (Exo) and extrapancreatic duct (EPD). IB, intestinal bulb; SB, swim bladder. Red box delineates region included for quantitation of islet and newly emerging anterior endocrine cells. (F) Quantitation of pancreatic EGFP+ cells (*P < 0.05, ***P < 0.001 with P values determined using one-way analysis of variance (ANOVA) with Bonferroni's post test). (G) Quantitation of anteriorly positioned EGFP+ cells in uninjected and morpholino injected embryos (error bars indicate standard deviation from the mean). Scale bar = 10 μM. As Pdx1 is required in second wave endocrine progenitors in mouse [13, 14], we hypothesized that the defect in late endocrine cell formation in double morphants could be due to loss of pdx1 only. To assess the individual contributions of pdx1 and hb9 to late endocrine cell formation, we quantitated NeuroD cell number in single morphants. At 3 dpf, EGFP+ cells in hb9 morphants were only slightly reduced relative to controls, whereas in pdx1 morphants EGFP+ cells were reduced by 50%, similar to the number observed in double morphants (Figure 3A-D, F). In addition, control embryos had EGFP+ cells located anterior to the islet that were absent in double morphant embryos (Figure 3B). These cells occupied a position corresponding to that of previously described late-arising endocrine cells [4, 32]. Strikingly, in pdx1 morphants but not in hb9 morphants, the anterior EGFP+ cells were also absent (Figure 3C,D,G). Thus, the formation of late endocrine cells specifically depends on pdx1, while early endocrine cells were specified in the absence of pdx1 or hb9 [see Additional file 5]. We also confirmed the persistent deficiency in new endocrine cell formation by examining NeuroD:EGFP+ cells in the principal islet at 5 dpf in pdx1 morphants as compared to control embryos, and found that NeuroD:EGFP cells remained dramatically reduced [see Additional file 6A]. Furthermore, in pdx1 morphants (n = 7), NeuroD:EGFP+ cells in the principal islet expressed Pdx1 at low levels, as compared to robust expression in controls [see Additional file 6C]. As ins-expressing cells have increased by 3 dpf in pdx1 morphants (Figure 1I), these beta cells originated from early specified, first wave endocrine precursors that differentiate under conditions of deficient Pdx1. Second wave endocrine cells arise in association with the developing ductal epithelium [10, 32]. To precisely localize the site at which pdx1-dependent anterior endocrine precursors arise, we immunostained TgBAC(NeuroD:EGFP)nl1;Tg(ins:dsRed)m1018 embryos at 3 dpf for the duct marker 2F11. NeuroD-expressing cells were found along the extrapancreatic duct (EPD), showed coexpression of 2F11, and even appeared to be emerging from the duct, with elongated processes characteristic of delaminating and migrating cells (Figure 4A-D). In support of their identity as endocrine precursors, occasionally such anterior NeuroD:EGFP cells expressed low levels of Ins:DsRed and thus correspond to newly differentiating beta cells (Figure 4C [see Additional file 7A]). This was confirmed by insulin (Ins) antibody staining [see Additional file 7C]. Anterior NeuroD:EGFP cells are migratory endocrine precursors. (A-D) Confocal sections of 3 days post fertilization (dpf) TgBAC(NeuroD:EGFP)nl1; Tg(ins:dsRed)m1018 embryos colabeled with antibodies against green fluorescent protein (GFP) and duct marker 2F11 (in blue). GFP+/2F11+ cells emerge from the duct (arrows), some with long projections typical of migrating cells (A, B, arrowhead). An individual cell that has separated from the duct is weakly DsRed positive (C, arrowhead). (E) Confocal image projections from a timelapse sequence of a 3 dpf TgBAC(NeuroD:EGFP)nl1;Tg(-8.0cldnb:lynEGFP)zf106 double transgenic embryo [see Additional file 8]. Membrane-linked enhanced green fluorescent protein (EGFP) in Tg(-8.0cldnb:lynEGFP)zf106 embryos delineates the gut epithelium (blue outline = extrapancreatic duct (EPD)) while robust cytoplasmic EGFP is present in NeuroD-expressing cells. Two NeuroD:EGFP cells (arrow) adjacent to the EPD migrate to the principal islet. All embryos are shown from ventral view, with the anterior to the left. Scale bar = 15 μM. To document the emergence of these anterior endocrine cells, we developed a timelapse imaging technique based on a method described for imaging the central nervous system . The large yolk cell, which normally obstructs the deeply located pancreas, was paralyzed and then extracted to establish a clear ventral view. This procedure did not interfere with morphogenetic processes. Using this novel method, we performed timelapse analysis of TgBAC(NeuroD:EGFP)nl1;Tg(-8.0cldnb:lynEGFP)zf106 embryos at 3 dpf. In double transgenic embryos, we recorded active delamination and clustering of NeuroD:EGFP-positive cells adjacent to the extrapancreatic duct and migration of cells towards the principal islet (Figure 4E [see Additional file 8]). Thus, our method allows the visualization of dynamic cell behaviors in the context of the developing organ in real time, and unambiguously demonstrates that new endocrine cells emerge from the duct epithelium and join the principal islet. Having established that second wave endocrine precursors emerge from the duct, we analyzed if their absence in pdx1 morphants could be caused by a global duct defect. At 72 hpf, duct development appeared normal in morphant embryos, as demonstrated by a normal pattern of GFP-labeled duct cells in Tg(-3.5nkx2.2a:GFP)ia3 transgenics  [see Additional file 7D-G]. Furthermore, Tg(-8.0cldnb:lynEGFP)zf106 embryos, in which EGFP outlines membranes of the gut epithelium, revealed normal cellular structure of the extrapancreatic duct in pdx1 morphants as compared to controls [see Additional file 7H]. We examined Pdx1 expression in these embryos to address whether Pdx1 might have a role within the duct as new endocrine cells emerge. Pdx1 was highly expressed throughout the extrapancreatic duct and proximal pancreas in control embryos, while expression was very weak in pdx1 morphants [see Additional file 7J]. This analysis indicates that depletion of Pdx1 eliminated the ability of duct-associated cells to give rise to endocrine precursors and argues against an overall perturbation of the duct. We next asked the question whether late endocrine precursors arise from a mitotically active cell population. We tested this by incubating control and pdx1 morphant TgBAC(NeuroD:EGFP)nl1 embryos with nucleotide analog EdU from 28 hpf to 76 hpf. This extended incubation is expected to label dividing NeuroD+ endocrine precursors and dividing duct cells whose progeny differentiated into NeuroD-expressing endocrine cells. At 76 hpf, an average of 1.6 NeuroD:EGFP cells/embryo in control embryos were EdU positive, and their number in pdx1 morphants was not significantly different (1.4 NeuroD+/EdU+ cells/embryo (Figure 5I). In addition, rare EdU+/NeuroD+ cells were found at the periphery of the islet and distal to the islet, along the extrapancreatic duct in control embryos (Figure 5A-D). In summary, the NeuroD+/EdU+ double-labeled cells (average 1.6/embryo) cannot account for the appearance of ten additional NeuroD-expressing cells that emerge in embryos between 28 hpf and 76 hpf. Furthermore, most NeuroD+ cells outside of the principal islet were EdU-, indicating that late endocrine cells appearing after 28 hpf arose from post-mitotic precursors. The pdx1 morphant showed a similar low number of NeuroD+/EdU+ cells, which were all associated with the islet (Figure 5E-H). Our data therefore suggest that late endocrine cells emerge predominantly from a postmitotic cell type. Contribution of cell proliferation to late endocrine cell expansion. TgBAC(NeuroD:EGFP)nl1 embryos incubated with EdU from 28 to 76 h post fertilization (hpf), followed by EdU detection and green fluorescent protein (GFP) antibody staining. (A, E) Confocal projections and single plane views (B-D, F-H), showing pancreatic region of control (A-D), and pdx1 morphant (E-H) embryos. (B-D) In control embryos, EdU/NeuroD:enhanced green fluorescent protein (EGFP) colabeled cells are located at the periphery of the islet (red arrowhead) and in the region of the extrapancreatic duct (EPD) (yellow arrowhead). Most islet cells are EdU- (C compared to D) and additional EdU-/NeuroD:EGFP+ cells are found along the EPD (yellow arrows). (F-H) In pdx1 morphants, few EdU/NeuroD:EGFP colabeled cells are found within the islet (red arrowhead). (I) Quantitation of EdU/NeuroD:EGFP cells per embryo in wild-type and pdx1 morphant embryos, showing mean and standard deviation. Scale bar = 10 μm. NS, not significant; P > 0.05 as determined by unpaired t test. As proliferating cells were found directly adjacent to the NeuroD:EGFP+ islet, we next used the Tg(ela3l:EGFP)gz2 allele that labels exocrine pancreas  to define their identity. 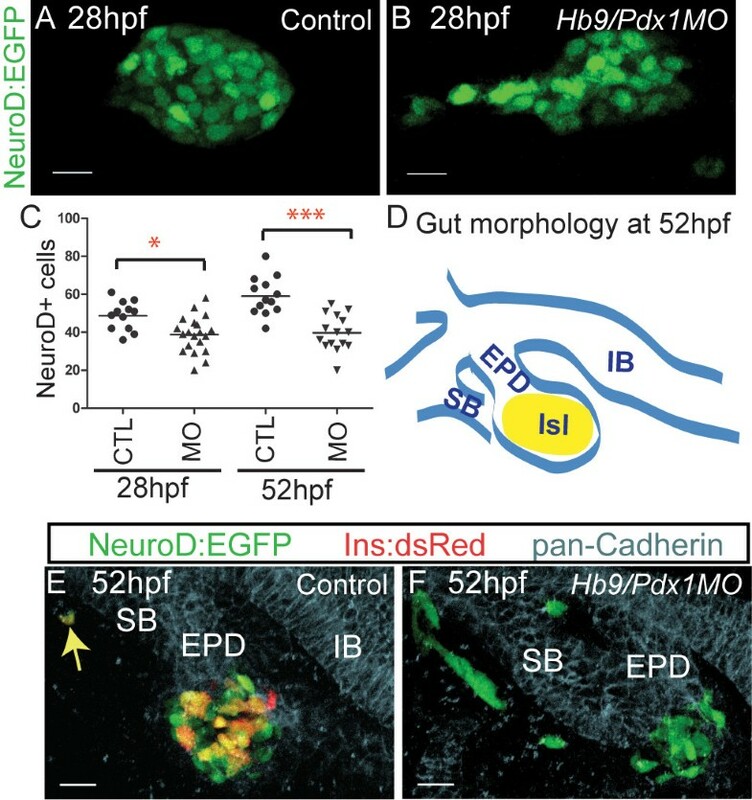 Incubation of embryos from 28 to 76 hpf with EdU, followed by a 12-h chase, resulted in extensive EdU labeling of the GFP+ exocrine pancreas in control as well as in pdx1 morphant embryos [see Additional file 9]. Therefore, ventral bud cells forming the exocrine pancreas are highly proliferative during this time period, and in pdx1 morphants no general proliferation defect exists in the pancreas. We conclude that beta cell recovery in pdx1 morphants is not accompanied by activated proliferation in progenitors or differentiated beta cells, but occurs through delayed precursor differentiation. The zebrafish intrapancreatic duct is a ventral bud derivative containing Notch-responsive endocrine progenitors that begin to differentiate and assemble into secondary islets after 3 dpf [5, 7]. Blocking Notch signaling after 3 dpf was previously shown to induce differentiation of endocrine cells from duct-associated progenitors [5, 7]. We assessed whether the latent endocrine progenitors associated with the intrapancreatic duct also arise in a pdx1-dependent manner. To visualize the emergence of endocrine cells from the intrapancreatic duct, we first used a Notch inhibitor (N-[N-(3,5-difluorophenacetyl)-L-alanyl]-S-phenylglycine t-butyl ester (DAPT)) to induce endocrine differentiation and NeuroD:EGFP expression in latent progenitors. In control experiments, treatment of TgBAC(NeuroD:EGFP)nl1 embryos with DAPT from 3 to 5 dpf caused an increase of cells in the principal islet and a fourfold increase of GFP labeled cells within the pancreatic tail as compared to vehicle-treated larvae (Figure 6A,E,F,K). Overlapping expression of Ins and GFP following DAPT treatment confirmed that newly-induced NeuroD:EGFP cells in the pancreatic tail can differentiate into beta cells (Figure 6B,D). Notch-responsive endocrine progenitors are absent in pdx1 morphants. (A-D) Confocal image projections of Tg(NeuroD:EGFP)nl1 embryos immunostained for green fluorescent protein (GFP) and insulin. Optical sections that obscure the posterior pancreatic tail have not been included. (E-J) Native enhanced green fluorescent protein (EGFP) expression in the pancreas of living TgBAC(NeuroD:EGFP)nl1 embryos at 5.5 days post fertilization (dpf), with overlay of concurrently acquired brightfield image. Shown are uninjected control embryos (A-D, E, F), hb9 morphants (G,H) and pdx1 morphants (I,J) treated either with vehicle (dimethylsulfoxide (DMSO)) (A,C,E,G,I) or 100 mM N-[N-(3,5-difluorophenacetyl)-L-alanyl]-S-phenylglycine t-butyl ester (DAPT) (B,D,F,H,J) from 3 to 5 dpf. DAPT treatment in control embryos leads to the induction of EGFP expression in the pancreatic tail (A,B,E,F) and of Ins in individual of these EGFP+ cells (B, D). In hb9 morphants the patterns of EGFP expression in DMSO-treated and DAPT-treated embryos are similar to that in control embryos (E-H), while pdx1 morphants show decreased EGFP+ cells in the principal islet and virtually no posterior EGFP+ cells are induced by DAPT (I,J). All embryos lateral view, anterior to the left. Scale bar = 10 μM. (K) Quantitation of NeuroD:EGFP cells induced in the pancreatic tail following DAPT treatment in control and morphant embryos. Graphed are the mean and SD for (n) number of embryos. P values were determined using one-way analysis of variance (ANOVA) with Bonferroni's post test, ***P < 0.001. We next analyzed if these Notch-responsive cells were present in pdx1 and hb9 morphants. We found virtually no NeuroD:EGFP induction following DAPT treatment in pdx1 morphants, while DAPT treatment in hb9 morphants resulted in an increased number of NeuroD:EGFP+ cells similar to controls (Figure 6G-K). Immunostaining for duct marker 2F11 indicated that intrapancreatic duct formation in pdx1 morphants was comparable to controls [see Additional file 10A]. Overall, this indicates that Notch-responsive progenitors for late-forming endocrine cells, that contribute new cells to both principal islet expansion and secondary islet formation, require pdx1 (Figure 7). Schematic of Notch-responsive progenitors. In wild-type embryos (top), an early pancreatic progenitor (yellow) gives rise to early endocrine cells (green) as well as progenitors for late endocrine cells (white) located in the extrapancreatic duct (EPD) and pancreatic tail. Notch signaling maintains these latent progenitors in an undifferentiated state. Inhibition of Notch signaling by treatment with N-[N-(3,5-difluorophenacetyl)-L-alanyl]-S-phenylglycine t-butyl ester (DAPT) (center) activates differentiation of the latent progenitors, leading to new endocrine cell formation in the principal islet and pancreatic tail (red arrows). In pdx1 morphants (bottom), early endocrine specification occurs but Notch-responsive progenitors for late endocrine cells are absent or hindered in differentiation, which can be demonstrated by treatment with DAPT. In this work, we determined that both hb9 and pdx1 have roles in early beta cell formation and that pdx1 is distinctly required for second wave endocrine progenitor specification, which generates endocrine cells that expand the principal islet and form secondary islets. Prior studies of pdx1 morphant zebrafish did not quantitatively assess endocrine cell dynamics, and therefore the requirement for Pdx1 in formation of progenitors for late endocrine cells went unrecognized. Our new imaging approach allowed us to visualize the behavior of emerging endocrine cells in real time and define the source of the late endocrine progenitor cells. Specifically, we show that they originate and delaminate from the ductal epithelium in a process that resembles formation of second wave endocrine cells in mammals. Our findings identify a genetic requirement for formation of late endocrine cells, establish the site where the latent postmitotic cell type that gives rise to the endocrine progenitor resides, and describe a novel method to visualize morphogenetic events that occur during islet formation. Embryos deficient in either pdx1 or hb9 alone display an initial decrease in ins expression, followed by restoration of some ins-expressing cells by 5 dpf. We show here that in double morphants such a recovery does not occur, and define pdx1 and hb9 dependent steps in the generation and differentiation of two distinct endocrine cell populations arising in the early and late embryo. The early appearance of NeuroD:EGFP-expressing islet cells demonstrated that committed, first wave endocrine cells of the dorsal bud were specified despite the absence of hb9 and/or pdx1. By contrast, second wave endocrine cells strictly depend on pdx1. The apparent recovery of beta cells in pdx1 morphants thus results from delayed differentiation of early arising, dorsal bud-derived endocrine precursors in conditions of severely reduced Pdx1. Since we have detected hb9 in ventral bud-derived beta cells (D Mayer, RA Kimmel, unpublished results), and Hb9 knockout causes global beta cell deficits in mouse, delayed beta cell differentiation in hb9 morphants can be explained by restoration of protein function due to dilution of morpholino at the time when late endocrine cells emerge. During organ development, progenitors are often set aside during the early stages to undergo later expansion and differentiation. In prior studies of beta cell proliferation during zebrafish embryogenesis using nucleotide analogs or proliferating cell nuclear antigen (PCNA) antibody, dividing beta cells were detected only very rarely or not at all [3, 6, 18, 36, 37]. To analyze and define the proliferative status of cells generating the late-arising endocrine cells, we used a protocol in which embryos were exposed to a long pulse of EdU covering the time window when late endocrine cells start emerging (from 28 to 76 hpf). This captures all cell divisions and also labels cells that proliferate prior to endocrine differentiation. Indeed, due to the prolonged labeling time, we observed a higher proportion of cells that had undergone proliferation as compared to previous studies, indicating that dividing progenitors that gave rise to beta cells as well as the rare beta cell mitoses were revealed. Nevertheless, the low number of EdU+ endocrine precursors and beta cells that we detected in normal development shows that the vast majority of late arising endocrine cells (appearing between 28 hpf and 76 hpf) have not undergone mitosis during the labeling period. Therefore, these cells differentiate directly from a precursor with low proliferative activity. Similarly, in the pdx1 morphant, proliferating beta cells or mitotic progenitors contribute only a minor fraction to the beta cells emerging after 28 hpf. These studies indicate that, during normal development, the cell type that gives rise to late endocrine cells represents a subtype of ventral bud cells that is already set aside at 28 hpf, and that slowly divides in contrast to the rapidly dividing cells that form the exocrine pancreas. Previous analysis showed that the ventral pancreatic bud contains ptf1a-expressing cells that form the exocrine pancreas and a distinct population that responds to Notch and gives rise to endocrine and duct cells . Our data indicates that within the non-exocrine cells, there is a population of non-proliferative cells that comprises latent endocrine progenitors. A major finding of this work is the requirement for pdx1 in specification of all late forming endocrine cells. Expression of Pdx1 is very dynamic in the developing pancreas and genetic analyses using conditional and hypomorphic Pdx1 mutant alleles in mouse have already indicated that Pdx1 is important in various specification and differentiation events [38–41]. In zebrafish, fate-mapping studies indicated that a spatial separation of the future pancreatic DB versus VB progenitors is already established shortly after gastrulation (10 hpf) [42, 43]. Medium levels of pdx1 expression during early somitogenesis (10 to 15 hpf) correlate with VB fate specification . Thus, already these early differences in pdx1 expression could provide permissive or instructive cues for the specification of latent progenitors that later give rise to second wave endocrine cells. The developing extrapancreatic duct and the proximal pancreas express high levels of Pdx1 from 48 hpf ( and this study). In pdx1 morpholino-treated embryos, Pdx1 is diminished at least until 3 dpf, but overall formation of the extrapancreatic duct is not affected. An absence of duct-associated progenitors for second wave endocrine cells could result from duct cells being committed to a non-endocrine fate due to an early deficiency in Pdx1. Alternatively, deficient Pdx1 in duct cells might impede the generation of endocrine precursors from a latent progenitor. Several lines of research suggests that pancreatic ductal epithelium is heterogeneous and contains a limited numbers of cells that have the potential for endocrine differentiation . We have here defined a strategy that eliminates endocrine cell formation without affecting duct morphology, which will be useful to help further characterize the latent progenitor cell type. Our transgenic and timelapse analyses provide new insights into the behavior of late-arising endocrine cells. NeuroD:EGFP-positive cells associated with the extrapancreatic duct defined by 2F11 antibody staining exhibited protrusions characteristic of delaminating cells. We developed a method for maintaining embryo viability after yolk removal, which allowed for the first time a clear visualization of developing late endocrine cells in living embryos. We delineated pancreatic progenitors in the context of the pancreatic duct and digestive system, and recorded migration of NeuroD:EGFP positive endocrine progenitors as they emerged from the duct and moved to the principal islet. This method provides the basis for future analysis of molecular regulators of these complex morphogenetic events during pancreatic islet development. These studies establish that pdx1 is essential for generating an endocrine cell progenitor population associated with the pancreatic duct in zebrafish. We show that formation of latent progenitors in the extrapancreatic and intrapancreatic duct requires pdx1, and provide evidence that they are slowly dividing cells, and are thus distinct from rapidly proliferating cells that form the exocrine tissue. Further, these latent progenitors differentiate in response to Notch inhibition. Our findings open up new approaches for examination of the specification and behavior of endocrine progenitors during zebrafish embryogenesis, in which these processes can now be visualized, and where large-scale chemical and pharmacologic screening can be applied. This can in turn provide clues as to how developmental programs can be harnessed and reactivated to generate replacement beta cells for more efficient treatment of diabetes. The following transgenic lines were used: Tg(ins:dsRed)m1018 (generous gift of Wolfgang Driever, University of Freiburg, Germany), Tg(ela3l:EGFP)gz2 ; TgBAC(NeuroD:EGFP)nl1 ; Tg(-3.5nkx2.2a:GFP)ia3 ; Tg(-8.0cldnb:lynEGFP)zf106 . Zebrafish (Danio rerio) were maintained according to standard protocols. The following previously validated morpholinos, targeted against the initiation codon of pdx1 and hb9, respectively, were obtained from Gene Tools (Philomath, OR, USA): pdx1MO: 5'-GATAGTAATGCTCTTCCCGATTCAT-3' [18, 19]; hb9MO: 5'-TTTTTAGATTTCTCCATCTGGCCCA-3' . Each morpholino was prepared at a concentration of 1.5 mM. This solution was diluted to 750 μM in water and 2 to 8 ng of morpholino in a volume of approximately 1.5 nl was injected into one-cell stage embryos. In generating double morphants, the concentration of individual morpholinos was halved to keep the total amount of morpholino injected the same as for single morphants. Whole mount in situ hybridization was performed as described . Digoxigenin antisense probes (Roche, Vienna, Austria) were synthesized for insulin . As precise cell counting in older embryos becomes difficult with increasing cell numbers in a tight cluster, embryos with cell count > 5 were grouped together for quantitation. Embryos were fixed in 4% paraformaldehyde (PFA) at 4°C (2 h to overnight, depending on stage) followed by proteinase K (Carl Roth, Karlsruhe, Germany) digestion (10 μg/ml in phosphate-buffered saline (PBS)), post fixation in 4% PFA, and incubation in blocking buffer containing 1% bovine serum albumin (BSA, AppliChem, Darmstadt, Germany), 2% Sheep serum (Sigma, Vienna, Austria), 1% Triton, and 1% dimethylsulfoxide (DMSO). Primary antibody was diluted in blocking buffer followed by overnight incubation at 4°C. Embryos were washed in PBS/BSA/Triton, and incubated overnight at 4°C in secondary antibody diluted 1:1,000 in blocking buffer, followed by extensive washing in PBST (PBS + 0.1% Tween 20). Primary antisera and dilutions were: guinea pig anti-insulin (1:200, Dako, Vienna, Austria), rabbit anti-glucagon (1:200, Dako), rabbit anti-pan-cadherin (1:500, Sigma), mouse anti-2F11 (1:100, generous gift from Julian Lewis, London Research Institute, UK), rabbit anti-somatostatin (1:200, Dako), rabbit anti-carboxypeptidase A (1:200, Chemicon, Vienna, Austria), mouse anti-GFP (1:200, Roche), rabbit anti-GFP (1:200, Torrey Pines Biolabs, East Orange, NJ, USA), guinea pig polyclonal anti-Pdx1 (1:200, generous gift from Chris Wright, Vanderbilt University, TN, USA). Alexa-conjugated secondary antibodies (1:1,000 dilution) were from Invitrogen (Lofer, Austria). EdU staining was performed as previously described . In brief, reagents for the Click-iT EdU Alexa Fluor 647 Assay (Invitrogen) were prepared according to manufacturer's protocol. Embryos were incubated in 0.5 mM EdU/0.4% DMSO in egg water (0.3 g/L Red Sea Coral Pro Salt in reverse osmosis H2O) followed by fixation in 4% PFA. Embryos were then washed in PBST, dehydrated with a methanol wash, and incubated in methanol at -20°C for 2 h. For the detection assay, larvae were rehydrated through a methanol series into PBST and manually deyolked. The larvae were treated with proteinase K (10 μg/ml) for 45 min, refixed in 4% PFA for 20 min, washed in PBST, and permeabilized in 1% DMSO/0.5% Triton/PBS. Incubation in Click-iT reaction cocktail was performed for 2 h at room temperature followed by rinses in PBST. Following the EdU detection reaction, larvae were incubated in blocking buffer and immunostaining was performed as described above. Tg(ins:dsRed)m1018 and TgBAC(NeuroD:EGFP)nl1 embryos for direct fluorescence imaging were fixed in 4% PFA at room temperature for 1 to 2 h (48 hpf and younger) or 2 to 3 h (older than 48 hpf), rinsed three times with PBST followed by manual yolk removal. Transgene and antibody immunostaining were imaged with a Zeiss LSM5 Exciter (Carl Zeiss, Vienna, Austria) confocal laser microscope, using a 40 × water immersion objective. Stacks of optical sections were recorded with a z-step ranging from 1 to 2 μm. Larvae for live imaging were anesthetized using 1 × Tricaine mesylate (0.003%, Sigma), immobilized in low melt agarose (1.5%, Biozym, Vienna, Austria) and imaged on a Leica DM6000B microscope (Leica Microsystems, Vienna, Austria) equipped with a SPOT-RT3 digital camera (Diagnostic Instruments, Inc., Sterling Heights, MI, USA), using a 20 × water objective. Fluorescence stack and differential interference contrast (DIC) images were captured using Visiview software (Visitron Systems, Puchheim, Germany). Fluorescence brightfield composite images were prepared with ImageJ (http://rsbweb.nih.gov/ij). Imaging of dorsal bud cell migration at 19 hpf was performed as previously described . For timelapse imaging of older embryos, 3 dpf embryos were anesthetized with 1 × Tricaine mesylate diluted in egg water, then the yolk cell was paralyzed by injection of 40 mM AMP-PNP (adenosine 5' (β,γ-imido)triphosphate, Sigma) and gently extruded using a tungsten needle followed by separation of ventral membranes to expose digestive tract and pancreas. Embryos were mounted dorsal side down in 1.5% low-melt agarose and covered with L-15 medium (Invitrogen) diluted to 67% with sterile water, and supplemented with penicillin/streptomycin cocktail (1 × final, Invitrogen), glucose (10 mM final, AppliChem) and 1 × Tricaine mesylate. Embryos were imaged for 5 to 10 h in a temperature-controlled room at 28°C. Images were collected every 5 min, a total z-stack of 60 to 70 μm was acquired with a slice interval of 2.5 to 3.5 μM. Images were captured using a 40 × water objective on a Zeiss LSM Exciter5 equipped with Zen 2008 software (Carl Zeiss), followed by processing and assembly of still images and videos using LSM Image Browser (Carl Zeiss) and ImageJ. NeuroD cell numbers in 24 hpf to 3 dpf embryos were quantitated using Imaris 7.1.1 software (Bitplane, Zurich, Switzerland). The spot detection algorithm was applied to three-dimensional reconstructions of samples to identify cells using a spot size of 3 to 4 μm. Spots were filtered, confirmed and edited by visual inspection, and cell counts transferred to Prism (GraphPad Software, La Jolla, CA, USA) for statistical analyses. For proliferation analyses, spot detection was similarly performed for EdU+ and NeuroD+ cells, double labeling of cells was determined using the 'colocalize spots' function of Imaris with a threshold value of 3 μm. DAPT (Sigma) was prepared as a 10 mM stock solution in DMSO. Larvae were incubated in DAPT diluted to 100 μM in egg water starting at 3 dpf for 48 h. The DAPT solution was replaced after 24 h. The embryos were then rinsed in egg water and incubated an additional 12 h. Control embryos were incubated in 1% DMSO in egg water. We thank Wolfgang Driever for general support during the initial phase of this project and for the Tg(ins:dsRed)m1018 fish line, Julian Lewis for the 2F11 antibody, Teresa Nicolson for the TgBAC(NeuroD:EGFP)nl1 fish line, Petra Haas and Darren Gilmour for the Tg(-8.0cldnb:lynEGFP)zf106 fish line, and Chris Wright for the Pdx1 antibody. We are grateful to Mayra Eduardoff for technical assistance, Tanja Walsen, Sonja Toechterle and Dzenana Tufegdzic for transgenic zebrafish care, and Pia Aanstad and Carmen Birchmeier for critical reading of the manuscript and helpful discussions. This work was funded by the University of Freiburg and Austrian Science Fund (FWF) grants P20492 and M1150 to DM and RAK, respectively. RAK and DM designed the research. EE, RAK, LO, AW and DM performed research and analyzed data. RAK and DM wrote the paper. All authors read and approved the final manuscript.